If you missed it—and these days that is entirely possible—over the weekend, North Korea tested yet another missile. It did land very far away as it fell just off the coast of North Korea near Russia. But it did travel far enough away to be of concern. Why? 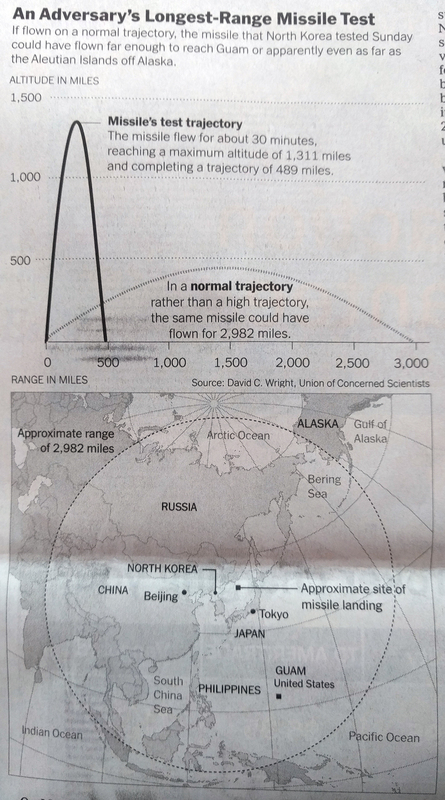 Well, this print graphic from the New York Times does a great job showing what that missile test really tested. I want to end on a geography lesson for Attorney General Jeff Sessions. Those little dots in the upper right part of the circle? Those are the Aleutian Islands. They are like that island in the Pacific known as Oahu, which is part of the state of Hawaii. The Aleutians are part of the state of Alaska, which is, you know, one of the 50 states. Just trying to help you out, sir. So if you ask why we care about defending those islands in the Pacific, well now you know.